What smells great and feels even better? An aromatherapy massage given by an expert massage therapist at Power Therapeutic Massage. You probably already know that Aromatherapy oils, candles and bath products smell amazing. What you might not know is that the essential oils that make these products smell so good have actual medicinal powers. Aromatherapy herbs like lavender, chamomile, ylang ylang, rosemary, eucalyptus and sage can do everything from lower your stress level, blood pressure and heart rate to boost your immune system to regulate your breathing and aid digestion. And you thought herbs just smelled good! Come in and enjoy all of the Aromatherapy Benefits. Aromatherapy massage combines the healing properties of these essences, in the form of highly-concentrated, therapeutic essential oils, with the soothing power of a massage. So while the stroking, kneading and rubbing of your highly-trained massage therapist releases tension and relaxes sore muscles, the essential aromatherapy oils stimulate your limbic system – the part of the brain that connects your sense of smell to your emotions and nervous system. The result is a deeper feeling of well-being and relaxation. This treatment is especially helpful in relieving headaches, digestive problems, back pain and PMS. But it’s an incredible experience for anyone looking for a really great massage. Since ancient times, aromatic herbs have been prized for their medicinal qualities. But it wasn't until the 20th century that scientists developed the technology to isolate and remove these essential oils from plants. Initially, these essential oils were used for perfumes. But that all changed one day in 1920s France, when chemist and perfumer named Rene-Maurice Gattefosse accidentally lit his arm on fire while working in his lab. Hoping to put out the flames, he immediately thrust his arm into the closest vat of liquid he could find – a vat of lavender oil. Gattefosse was amazed to find that his burn healed much more quickly than his previous burns had, without even leaving a scar. He realized the lavender oil was responsible, and dedicated the rest of his life to researching the properties of different plant oils. He christened the new science "aromatherapy", and fellow Frenchman Dr. Jean Valnet continued his work into the 1930s and 1940s. Aromatherapy massage came along approximately a decade later, when Margaret Maury created special massage techniques designed to incorporate essential oils. It has continued to grow in popularity, especially as spa treatments have become an essential part of everyday life over the past two decades. 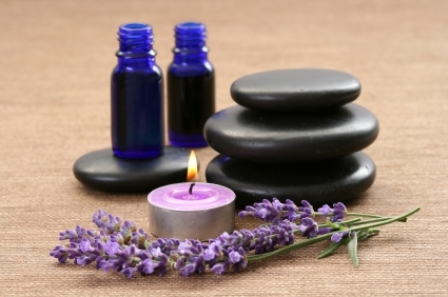 An aromatherapy massage works a lot like a traditional massage – it just smells better. Your experience will begin when you arrive and are taken by your therapist to a private room. There, you will be able to undress and lie on a comfortable massage table under a sheet. The room will be warm, so you won't need to worry about feeling chilled. When your massage therapist enters, he or she will warm some lotion scented with essential aromatherapy oils between his or her hands. The soothing fragrance will relax you throughout the massage. The massage itself will begin with a gentle stroking motion, and build to include kneading and rubbing of tight muscles to release tension. If anything feels painful or even uncomfortable, it is perfectly okay – and encouraged – to tell your therapist. If the pressure is too strong, it can be eased up. Of course, if you want a little more pressure, you can also ask your therapist to bring it on. As your massage continues, the affect of the powerful aromas and the release of pressure in your body might cause you to feel emotional. Don't worry, this is completely normal. When your session concludes, you should feel completely relaxed and calm, and should leave the treatment room feeling great. "Massage that includes the application of fragrant essential oils reduces anxiety and stress and is beneficial to the immune system, according to recent research." Department of Microbiology, Department of Psychiatry and Department of Epidemiology for Community Health and Medicine, Kyoto Prefectural University of Medicine Japan; Graduate School of Science for Human Services, Ritsumeikan University Japan; and Department of Research and Development, Hyper Plants Co., Ltd Japan. Originally published in Evidence-based Complementary and Alternative Medicine, 2005 Vol. 2, No. 2, pp. 179–184. "A study of the long-term effects of massage and aromatherapy on the physical and psychological symptoms of patients with advanced cancer showed that the intervention significantly improved subjects' quality of sleep." Princess Alice Hospice, in Esher, Surrey, United Kingdom; North Surrey Primary Care Trust, in Surrey, United Kingdom; The Royal Marsden Hospital, in Sutton, Surrey, United Kingdom. Authors: Katie Soden, Karen Vincent, Stephen Craske, Caroline Lucas and Sue Ashley. Originally published in Palliative Medicine, 2004, No. 18, pp. 87-92. "Researchers have shown that lavender and rosemary administered through aromatherapy positively affect psychological and physiological functioning." Touch Research Institute, Originally reported in the International Journal of Neuroscience, 1998, Vol. 96, pp. 217-224. To learn more about Aromatherapy Massage, check out one of these books. Adams, Rachel Learn the Power of Aromatherapy. eBook. Download Now! "This eBook gives you the expert guidance you need to take full advantage of all the healing and restorative powers Aromatherapy has to offer!" "Inside each bottle of essential oil lies the key to beauty, health, and well-being and this comprehensive illustrated reference contains all the information needed to work aromatherapy's magic"
"One of the most comprehensive, up-to-date encyclopedias of aromatherapy available today, with over 400 entries covering more than 200 conditions and 82 essential oils as well as recipes"